I don't make jewelry like I used to, (no time) but now and again if there is something in my life I'd like to celebrate or an occasion to remember, I'll pull out my wire and whip something up. 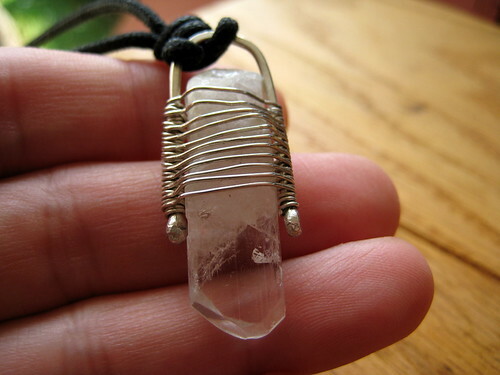 This is a Danburite crystal - one of my favorite stones. 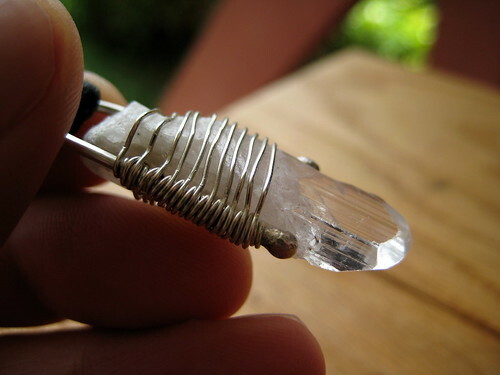 According to The Crystal Bible , Danburite "is an excellent stone for facilitating deep change and for leaving the past behind"
Wrapped in sterling silver wire, the main armature was melted on either end so the silver would form a ball. I hammered it into the shape I wanted, then wove a thin gauge wire around the front & back to secure the stone into place. Of note: Of all the jewelry I ever created, it was all "cold connected" meaning that I used no heat to solder or connect anything, but I did at one time use a small creme brulee torch to ball up the silver as shown above. It was a technique that was typically used for making something called a headpin , but also could be used for decorative purposes as well. The finished piece, strung on a black cotton cord. This is a very nice piece, Stephanie. 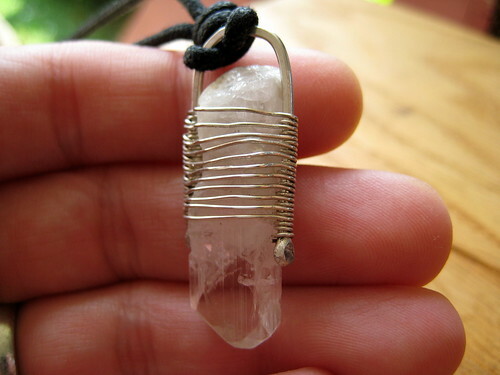 I tried my hand at beading, but not any silver wire wrapping. 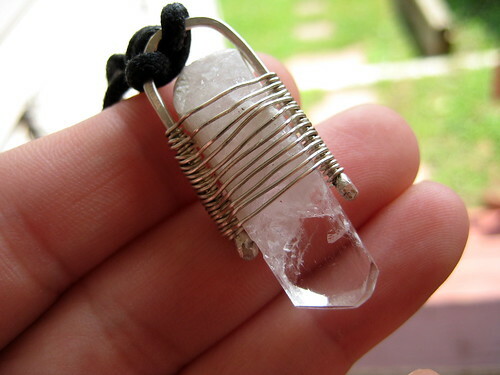 I think I should get a Danburite crystal and and meditate on leaving a lot of past stuff right where it belongs! I thought of you on Saturday when we watched Tibetan monks finishing up a colored-sand mandala at a local museum of Asian art. There were about 6 monks and they worked for a week from 10 to 5. I wish you could have seen the finished piece. I didn't have a camera with me unfortunately. Haven't tried googling it; maybe an image would turn up there. I did purchase a hand-made journal from them. I'll try to get the pics up in flickr. Thanks so much for this post, I have seen this type of jewelry in Harvard Square sometimes but never knew the relationship people had to their craft, which you communicated so concisely.